The Reds have money to spend following the €160 million sale of a Brazilian star to Barcelona. Riyad Mahrez has been linked with a move to Liverpool recently. 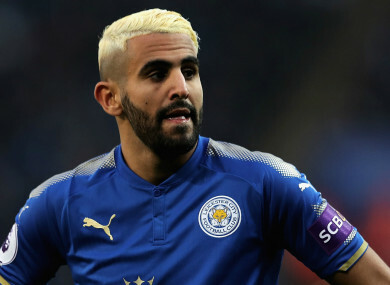 LIVERPOOL WOULD BE wrong to bring in Leicester winger Riyad Mahrez as a replacement for Philippe Coutinho, says Michael Owen. The Reds have money to spend following the €160 million sale of a key creative influence to Barcelona. Jurgen Klopp now has a hole to plug in his side, with various options being mooted as those at Anfield prepare to dip into the January market. Mahrez is among those to have been heavily linked with a move — amid ongoing rumours of interest from Arsenal — but Owen feels the Algeria international is unsuitable for Liverpool’s system. Looking ahead to the crunch clash with Manchester City on Sunday, the former Reds striker wrote in a column for BetVictor: “Liverpool begin life without Philippe in what promises to be one of the games of the season played between the two most exciting sides in the division. “I was asked this week if I thought Riyad, who has been linked with a move to Anfield, would be the ideal replacement for Coutinho, but I couldn’t agree. Mahrez has returned to something resembling his best form this season, following a dip in 2016-17. The 26-year-old was named PFA Player of the Year after helping to inspire Leicester to a remarkable Premier League title triumph, but then regressed somewhat as he sought a switch elsewhere. He has made no secret of his desire to move on and will be open to offers during the January window. Mahrez has seven goals to his name in the current campaign and a further seven assists. Email “Mahrez the wrong option to replace Coutinho at Liverpool - Owen”. Feedback on “Mahrez the wrong option to replace Coutinho at Liverpool - Owen”.